Product prices and availability are accurate as of 2019-04-21 03:52:02 EDT and are subject to change. Any price and availability information displayed on http://www.amazon.com/ at the time of purchase will apply to the purchase of this product. 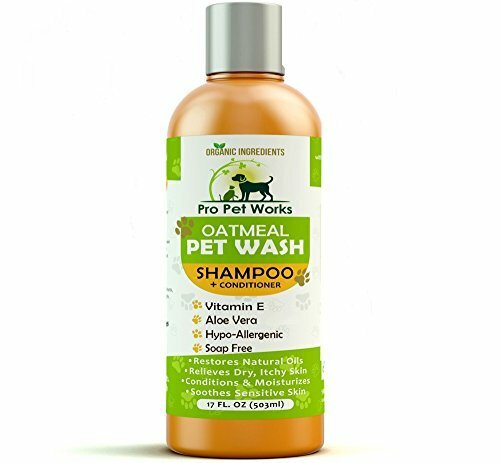 Pro Pet Works 5 In 1 Oatmeal Pet Wash is specially formulated for pets with flea bite, grass and food allergies as well as dry, itchy, sensitive skin. 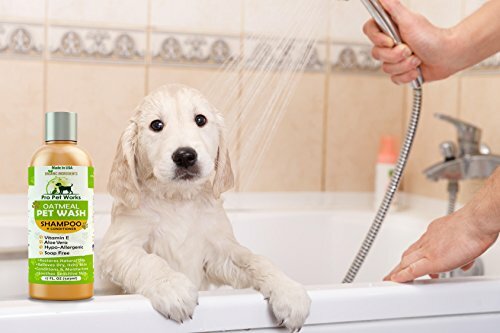 The combination of organic aloe vera extract, organic almond oils and Vitamins E, A & D will not irritate your pets eyes or nose while bathing. Some shampoos can strip your pet of their natural minerals and coat oils, but Pro Pet Works won't strip the coat of your dog's natural oil production. Meant for dogs and cats 12 weeks and over. Makes it a pleasure to brush and detangle your pet. Perfect for brushing and deodorizing and saves a trip to the groomer. Tough on the dirt, not your pet. The fine oatmeal granules absorb the allergens and help to mediate the itchy, dry skin that occurs due to this. VET RECOMMENDED: Our Oatmeal Pet Wash Dog Shampoo & Conditioner is recommended by Vets (take a look at our vet reviews). Specially formulated for pets with allergies to food, grass and flea bites. Can be used for DOGS, CATS, FERRETS & RABBITS. PH balanced for sensitive skin. "100% MONEY BACK GUARANTEE" NATURAL, ORGANIC INGREDIENTS THAT ARE MADE FOR DRY, SENSITIVE, ITCHY SKIN: The organic aloe vera and almonds oil is therapeutic and soothing for your pets skin and coat. Saves you a trip to the groomer and keeps your pet smelling fresh. Also works well as a pet deoderizer. 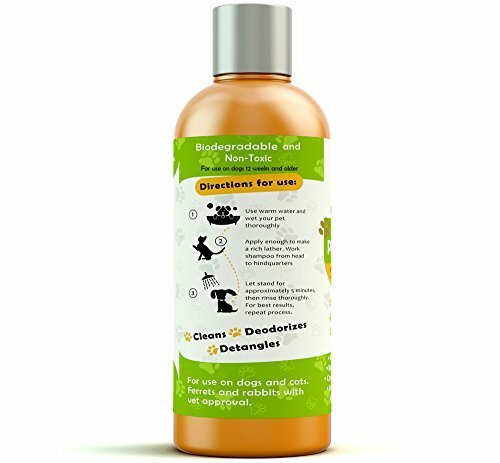 ALOE ENRICHED, SOAP-LESS AND DETERGENT FREE SHAMPOO THAT MAKES BATH TIME A PLEASURE Our special formulation has mixtures of organic aloe extracts, almond oil and vitamins A, D & E that wont irritate your dog's eyes, nose or skin while bathing. Makes for a soft, easy to brush, coat that will make your pet feel clean and smell clean several days after bathing. Tough on dirt, not your pet. OUR COMMITMENT TO EARTH & MOTHER NATURE: We strive to create a small print on our environment which is why our products are 100% biodegradable and made with recycled materials. 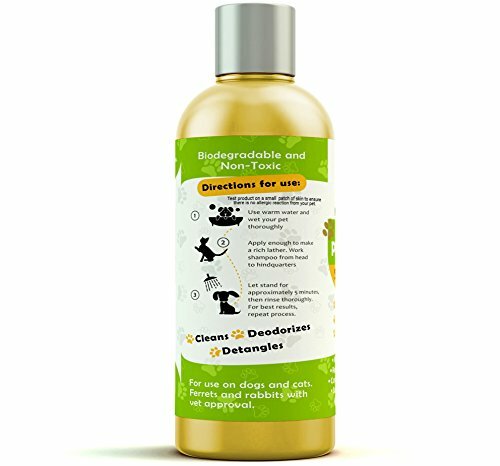 Our shampoo is non-toxic and non-alcoholic with no animal by products. OUR PLEDGE TO YOUR PET: We are a company of animal lovers and only want the best for your little pals We made this formula with care in mind for your pets and our own pets. After blending moisturizers, aloe vera and essential oils, we came up with a perfect blend that you would be proud to use on your best friend. Don't just take our word for it, try it and see the results for yourself.